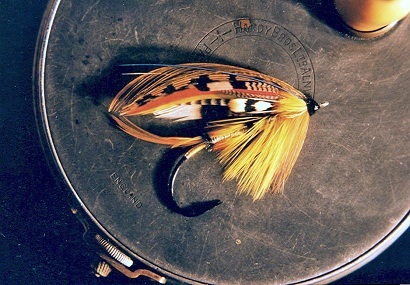 I dress Atlantic Salmon flies for the fly fisher and collector. My exhibition fully dressed feather wing flies are tied on hooks of outstanding quality. I use either antique hooks from my collection, or the impeccable hand made hooks by Ron Reinhold or Ronn Lucas Sr. Both of these artists’ hooks are magnificent re-creations of yesteryear. It is impossible to catalogue all fishing flies here. If you do not see the pattern you desire on these pages in the four categories above, please e-mail me with requests. Orders may be placed online on our contact page. Coming soon will be our online shopping cart. I do not keep a vast inventory of flies because most all flies I tie are sold. Please allow 3-4 weeks lead time for your order of fishing flies to be shipped. I pay the shipping cost and the Massachusetts sales tax. Please allow 6-8 weeks for delivery of fully dressed collectable flies. I now ship these flies in a Riker specimen box. I no longer frame the flies to be shipped. Too many bad things can happen to artwork in handling by UPS, FedEx and USPS. This will allow the customer to take a fly to a local framer they trust to do a quality archival job. Custom orders will be accepted. If you prefer barbless hooks, I can accommodate you. Please let me know if you need light wire salmon hooks or heavy irons. 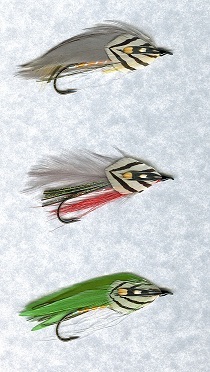 Please add $.50 to the price of each salmon fly for a double hook. I do not tie tandem streamer flies. I tie all flies here in Pepperell, Massachusetts, USA. I prefer to tie my fishing flies on quality American or British hooks. I dress my classic feather wing flies with substitutes for some of the original suggested plumage in certain Victorian era fly patterns. Though many more of the once scarce species such as Jungle fowl and Kori Bustard are now domestically raised, there are still feathers, which cannot be obtained because some species are illegal to import, and or, are protected or endangered. See our contact page for orders or inquiries.